If you spend hours happily, but kind of aimlessly, combing through historical photos and paintings of handspinning then you might notice that some very powerful women were spinners. Some of these women ran small countries. Some run huge freaking empires. Some of them used their spinning to subdue men. Hey. I’m a spinner. Maybe I could use that to get myself in charge of a small country and/or subdue men. See? I finished spinning this silk yarn just this week. 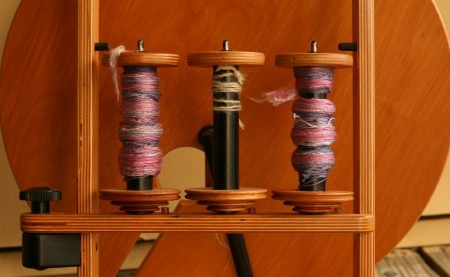 First I spun it up as lace-weight singles onto two bobbins. 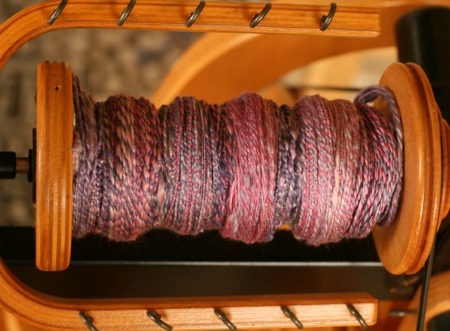 Then I plied it up and at a high speed. That got me 150 yds plied, and since I only had 2 ounces of it to begin with, 150 yds is pretty good. Its about sport weight. This makes me just like Queen Victoria of England don’t you think? She was Queen at a time when the British Empire was at its peak and doing all sorts of morally questionable but quite impressive things to expand its empire. Queen Vicki was so important that the other ruling families of Europe fell all over themselves to marry her children and her grandchildren (which is how hemophilia got spread around to the royals). And as this very important ruler, she wanted to show that she could spin yarn. She wasn’t the only one. Check out Queen Elisabeth of Romania, who wasn’t Romania at all but German. 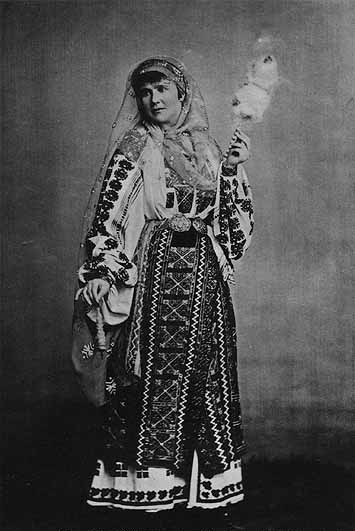 She decked herself out in traditional Romanian clothing and picked up her spindle and her distaff to have this very important picture taken. 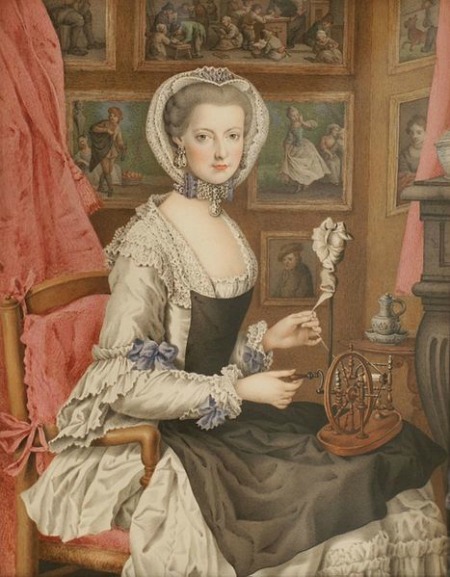 Go back a hundred years or so and you’ll find Archduchess Marie Christina of Austria at her mini-spinning wheel, and decked out in quite the outfit. Perhaps I should mention that Marie Christine was sister to Marie Antoinette. I guess that whole family believed in spend-spend-spend that tax-payer money. But it isn’t just powerful royals who spin (like I do). 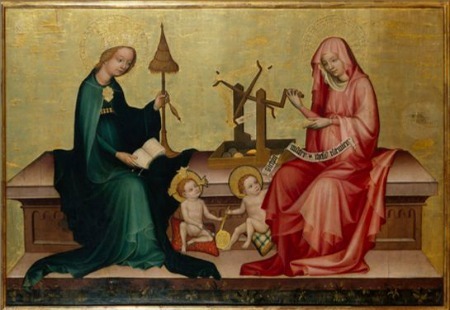 Painters in Medieval Europe loved to show The Virgin Mary spinning yarn (like I do). Here is my personal favorite: The Virgin Mary, St. Elizabeth and their two very important boy children. And yarn is happening. Now I’m not saying being able to spin yarn will help me get into Heaven (becasue that might be blasphemy) but maybe it won’t hurt either. Speaking of medieval artwork and spinning, did you know you could use a distaff to win an argument? Or inflict head injuries? The thing about spinning is that almost-always only women did it. I wrote about that before, in my post on ancient spindle whorls. They have only been found in the graves of women. Men seem to have carded wool and retted flax to get fiber ready for spinning. Men seem to have done some of the weaving after spinning. But spinning was women’s work and that is true across cultures. Which is why when Omphale, the Queen of Lydia, got her hands of Hercules, the hero of Greece, she made him spin yarn. That was part of his punishment. You see Hercules had accidentally murdered someone. (Again I mean. Hercules did that more than once.) So he was sold into slavery for one year to Omphale. 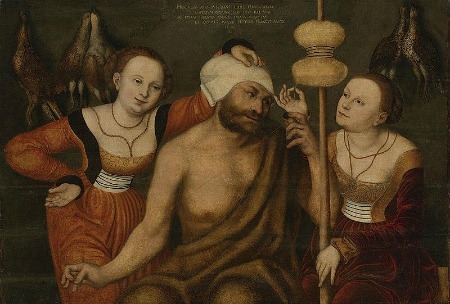 One of the things she did to poor Hercules was dress him as a women and make him spin. Compared to having to clean all the horse poop out of the Augean stables you would think making yarn would be like a vacation. But maybe not. Maybe it was humiliating. Spinning really was a woman’s thing. I could only find one picture of a famous man spinning (for fun) and maybe it is the exception that proves the rule. 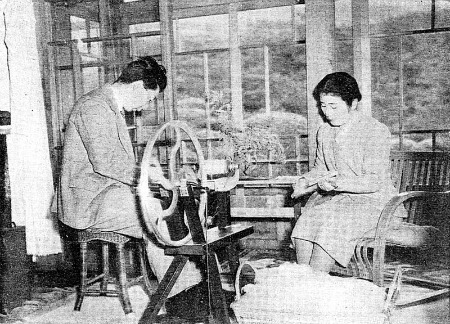 In a true reversal of gender roles, here is Princess Setsuko carding wool and Prince Chichibu spinning it. Again… just like me. I spin yarn. Maybe I could be royalty too. Maybe not. 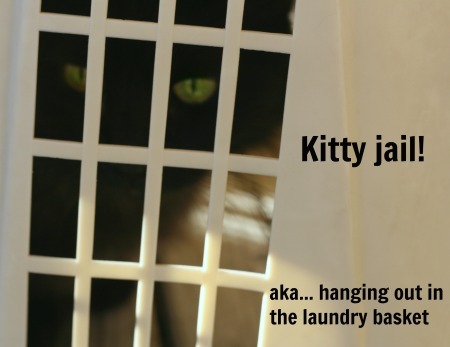 I think the highest position I will achieve in life is handmaiden to the Great and Powerful Feline Overlord of Austin. And since I’ve already achieved that, its probably all downhill from here. 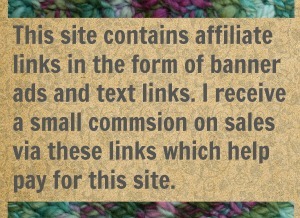 But I got some yarn spun this week. That’s something. 16 Comments on "Powerful Women Who Spun Yarn"
Is St Elizabeth using a vertical swift? I’ve been thinking of selling my traditional wooden swift so I can replace it with a more compact vertical model. This makes a compelling precedent! She is! Isn’t it nice to know that swift technology hasn’t changed much since the middle ages? I have a collapsible swift. Its horizontal but it folds up umbrella style and I can put it on the shelf. Pretty handy I have to say. Ahh yes you are so right. Ghandi was a spinner. Oh course Ghandi broke so many of society’s rules that him spinning was … lol… minor. But he did spin as an example to his people. Ghandi believed that more people spinning cotton would lead alleviate some of the crushing poverty and lend some economic independence. He was trying to re-vive the cottage industry. Better living through spinning and how awesome of an idea is that? You are a “power house” for certain. There is one of those miniature spinning wheels in an antique store in Dallas for $2500. Wish I could buy it! $2500! Wowzer. That is certainly out of my price range too. Is it newly manufactured or an antique? It is an actual antique. Of course they have it set up all wrong. I may make a field trip out there just to correct their mistakes, show them how it works, and show them this blog post! That would be FUN! You should go and give them a “helpful” lecture. And I’d show them that pic of Marie C. for certain. It might help them sell the wheel!